I’m a sucker for beautiful physical books. My wife loves her Kindle and I can appreciate having a library on a tablet, but there’s something about a nice hardcover book with rich pictures and thick paper stock that can’t be recreated on a screen. 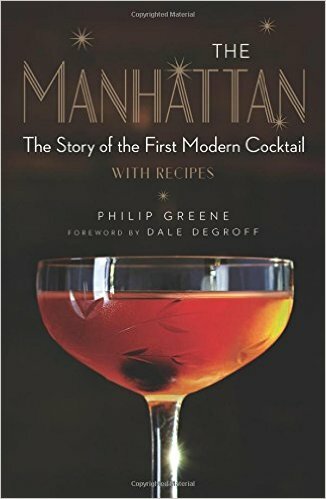 I received a copy of The Manhattan: The Story of the First Modern Cocktail by Philip Greene yesterday and was thumbing through it just for the feel. The hardcover has that soft silky feel to it, I don’t know enough about publishing to know what it’s called, and the pages are that thick semi-glossy stock that makes photos pop. OK, enough about the book binding, the content within was fun. I’ve long been a fan of the Manhattan but I never knew the history behind it and behind cocktails. Did you know the difference between a punch and a cocktail? A cocktail has a specific definition — “spirits of any kind, sugar, water and bitters.” So until the Manhattan, you had rum cocktails, brandy cocktails, gin cocktails, etc. No actual names because they just swapped out the spirit. Seems kind of boring right? So where does the Manhattan fit in? It’s the vermouth. Vermouth is aromatized, fortified wine with some kind of botanical element. Sweet vermouth is one of the two types of vermouth (the other being dry). A Manhattan is typically whisky, ice, sweet vermouth instead of sugar, bitters and then a brandied cherries. The sweet vermouth, infused with botanicals, is what changes the game. In part 1, the book goes through the history of The Manhattan, and of cocktail history, starting in the early 1800s until today. It’s full of fun trivia but it also explains the evolution of cocktails to the point that a lot of the recipes start making sense. You start with spirit, sugar, water and bitters and watch as bartenders innovate and build on ideas (including the recipes they used for historical drinks). It’s fascinating. Part 2 has all the recipes. You start with Classic Manhattans (Traditional, Dry and “Perfect”) but the list of cocktail recipes runs the gamut – you have recipes for a Smithtown Cocktail (as in Long Island, where I grew up, so you know I’m going to have to try this!) to the Metropolitan (made at the Metropolitan Hotel that opened in 1852) to the Queen’s Cocktail (a gin based cocktail that includes vermouth and pineapple). The book is a lot of fun. In fact, as I think back to the Great Gatsby event we just attended, if you were going to throw a themed party then this would be the book to get for ideas on cocktails to serve if you wanted to stay as authentic as possible. Even if you aren’t throwing a theme party but just wanted to learn more about cocktails, try some authentic period cocktails, this book is a joy to thumb through. If you don’t have a Kindle, you can always read it in the Kindle Cloud Reader via your browser. 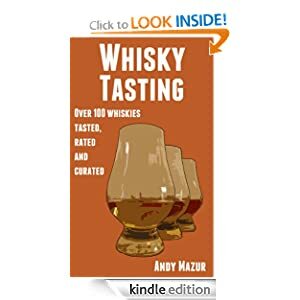 The book begins with some basic stuff, how to taste whisky, and glassware (he recommends a Glencairn) but the really fun part, and what I enjoyed, was when he organized whiskies into “flights,” as wines are often presented in restaurants. The book finishes with matching whisky with food. So, onto the flights, which I find is the more interesting part of this book. His general approach is to move from sweet to dry, fruity to smoky, young to old, blend to single-malt, and standard to cask strength. Personally, this is how I prefer to drink my scotch. If you go in the reverse, you bring along some baggage that really does impact your enjoyment of scotch. It doesn’t take a genius to know that if you start with an 25 year old, then even the 18 seems a little rough (and a 12 seems rougher still!). Four single malts from varying regions, you really get a nice who’s who of single malt scotches from this flight. You get a Speyside in Glenmorangie (at a very affordable price), Highland with Dalwhinnie, then the one two punch of Islay – Ardbeg and Lagavulin. I like the move of putting Lagavulin last because there’s a bit of a medicinal taste in Lagavulin, good for a final stop. Worth a look, certainly at that price!